The richly ruffled petals and regal stature give the poppy plant nirvana status for some gardeners. That said, the tenets of poppy gardening fall somewhere between the intermediate to the "I got lucky" end of the spectrum, and a little know-how will yield great dividends on this classic cottage garden favorite. Full sun and loose soil are two essentials for growing great poppies. A mild summer climate is a bonus. Juicy plum and blackberry tones look positively bewitching in the late spring flower garden. 'Patty's Plum' poppy features six-inch blooms on 30-inch stems and will tolerate average soil while deflecting hungry deer. Although plants will self-seed, the resulting plants may not produce the coveted purple blossoms. A simple root cutting is the preferred method of propagation. When you spy the first buds emerge from the Himalayan blue poppy, you know that really good things are about to happen. Congratulations, you successfully cultivated a Meconopsis genus of poppy. Blue poppies have a mystique that transcends their sky blue petals. Before you attempt this gardening hat trick, know that the plants, which are endangered in their native habitat, require consistently moist and cool weather. Like the tuxedos of the landscape, 'Black and White' lends elegance and charm to any garden border. The stark contrasting tones of black and white on crepe petals look arresting in flower arrangements, as long as you sear the stems with a flame to prevent the milky sap from flowing into your vase water. Unlike Oriental poppies, the California poppy is an annual, completing its life cycle in one growing season. However, these North American natives are very drought tolerant and inexpensive to grow, making them excellent candidates for wildflower gardens. For gardens that need a touch of romance, let the 'Helen Elizabeth' poppy come to the rescue. The petals exude that warm, wonderful peachy-pink glow that a woman might seek in a lipstick or blush. When the plants are done blooming, plant some cosmos around them to close in the gap that is left when foliage fades into summer dormancy. What a cheerful departure from the norm gardeners may claim in the pompom blooms of 'Tallulah Belle Blush' poppies. The hefty blooms of this Oriental poppy benefit from some support in the form of hoop stakes, even those as simple as common tomato cages. For gardeners who embrace the moody trend of black flowers, the black Oriental poppy is to die for. Of course, no real blossom is so rich in the pigment melanin as to be completely black, but the deepest purple or maroon flowers do appear nearly black on a cloudy day. Extend your black flower display with other seasonal blooms like black pansies and black bearded irises. Or, plant a contrasting stand of white spring flowers, like foxgloves. The heavily ruffled petals of Oriental poppy 'Orange Glow' are a beacon on cloudy spring days. 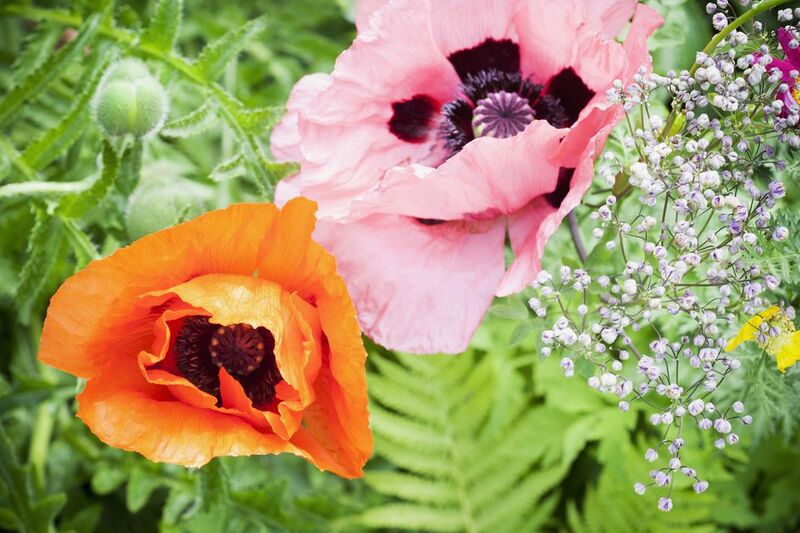 Plants are very hardy and will survive winter temperatures down to -40 degrees F.
Discover the most pale salmon tones that flatter all garden designs and planting companions when you add 'Khedive' poppies to your garden. After flowering, leave the ornamental seedpods intact for textural interest in the landscape. 'Goliath' poppies bear huge flowers on four-foot stems that shimmer in the June garden. When planted in loose soil and full sun, these plants will establish deep taproots that result in many years of blooms. Do you have room in your flower border for a few 'Picotee' Oriental poppies? The fully double blooms sport creamy centers with frilled orange edging, and add something special to any cut flower arrangement. It's difficult to imagine a bloom that's more exuberantly feminine in texture, color, and name than the Oriental 'Pink Ruffles' poppy. Plant them among delicate Gysophila baby's breath plants, which will hide the poppies' fading foliage in the summer. 'Turkish Delight' is descendant of the first pinkish-salmon Oriental poppy to be bred by Amos Perry in the early 1900's. This accidental sport, later named 'Mrs. Perry,' was the beginning of many new poppy color choices, after centuries of the same reddish-orange hues. Glowing crimson petals punctuated by deep fringing ensure that 'Turkenlouis' poppies will steal the show in your late spring or early summer garden. This poppy variety is an excellent choice for gardeners looking for a low-care perennial that attracts hummingbirds.